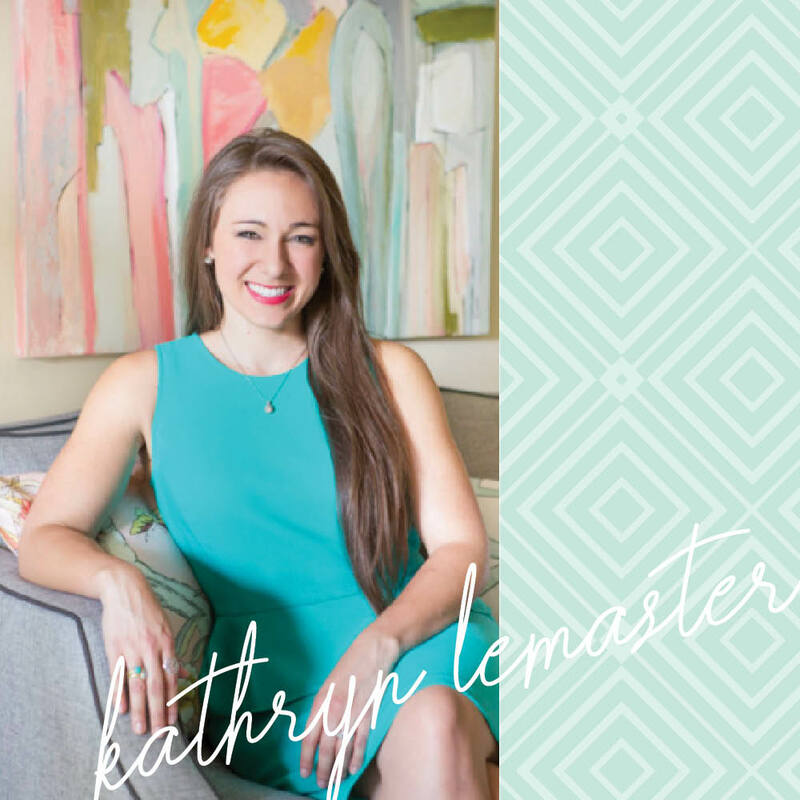 Introducing the new interior designer website launch for Kathryn J. Lemaster Art & Design. When Kathryn contacted us, she was at a loss with the ease of updates on her current website. 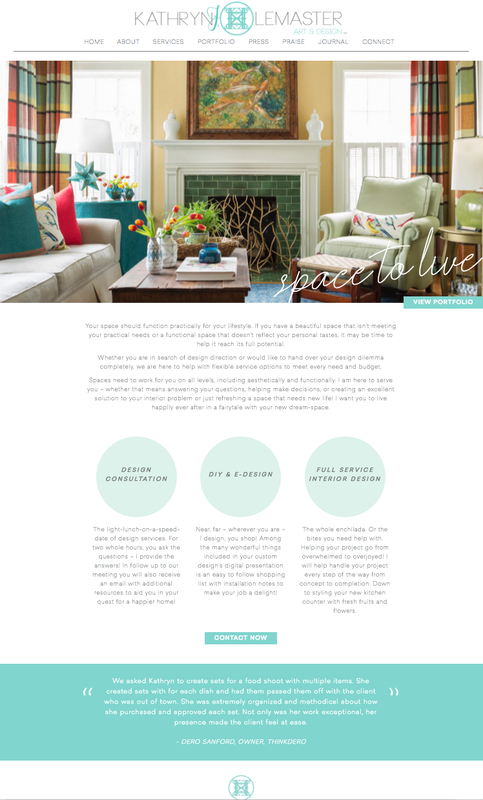 As a designer, she wanted something that not only would reflect her design aesthetic, but also showcase her bright portfolio, and make updating feel like a breeze. 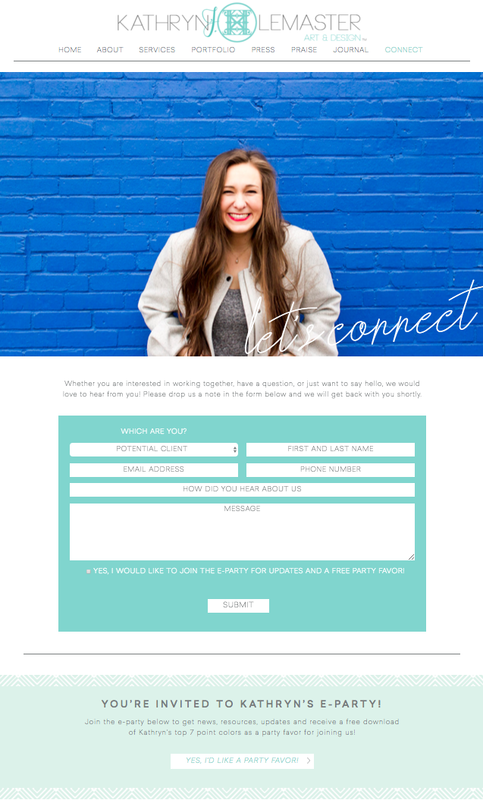 We created a custom site, packed full of personality with mint and turquoise accents throughout, as well as lighthearted copy, and a few handwritten words throughout. 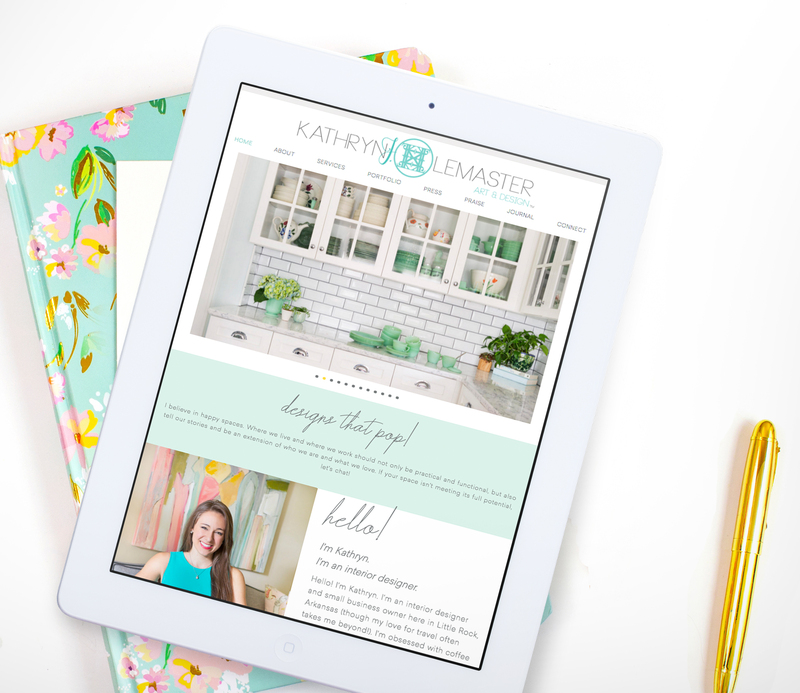 Using Kathryn’s fun-loving personality, we created pops up color, patterns and an easy navigate layout for her users to surf through seamlessly. Since Kathryn was skilled in both residential interior design and production design – we focused on separating the site out into two different paths for her users to follow. No detail was left untouched, from her homepage to the contact page – it was all about vibrance and personality! We asked Kathryn to tell us a bit about herself, her business and her experience working with us. Why did you start your business? Because I needed a job, and decided I didn’t want to work for someone else! That’s the practical reason. The heart of it though was that I longed for creative freedom to serve people I saw had a need that I could meet with my specific gifts and skills. I hoped I could make a living doing so, because if not, I was going to have to get a side job to fund this passion. Ha! Having a business is the channel that dream could come to life through. So, I took the leap. As it turns out, I’m now a business nerd too and find that entrepreneurship is in fact the life for me! I hope alot of things, but the number one feedback I get from my clients on what they believe if unique about working with me is that I truly listen to them and honor them throughout their project. And it is my joy to take their unique requests, little quirks, and unusual treasures and take all of that in to account when creating their design so that it truly reflects them and meets their specific needs in a very special way. Interior Design is such a personal business. People are trusting me with their personal space, letting me in to their homes to see how the live and letting me in on what they need help with. I see the messy closets, the piled counter tops, what’s working, what’s not – the behind the scenes of their lives. I treat that kind of vulnerability with utmost care and respect. I consider the ground on which we work – their homes – sacred. There is alot of self-discovery along the way, as they learn about their own likes and dislikes, priorities and preferences when it comes to their own lifestyle and home. We all need to be able to work together within a safe space, so criticism and judgement have no part in the design process. Only listening, problem solving, and creating. Improving your home should be an uplifting, enriching, personal experience! Goodness! This could be a wild one. I just checked my “recently played” on Spotify and have everything from the jazzy classics of Dean Martin, Frank Sinatra and Harry Connick Jr., to indie and synth-pop like Walk The Moon, Magic Man, and Borns – to folk such as Lord Huron, Joshua Radin, and Taylor John Williams. Basically my musical taste is about is eclectic as my decor taste. My newest song find that I’ve been playing on repeat this week is “Feel it Still” by “Portugal. The Man” – who I’d never heard of until this song, which has such a fantastic beat! Everywhere! I have 24,000 photos and counting on my phone largely due to my snapping-inspiration-everywhere-I-go “problem”. It doesn’t matter if I’m eating at a new restaurant, meandering down a sidewalk, driving through a neighborhood, traveling to a new city, wandering through the park. I look up, down, and around, expecting to be amazed – and I’m never disappointed. There is always a pattern, color or texture just waiting to be discovered and appreciated! Why did you decide to work with Doodle Dog? Why did you feel the time was right to kick-off this project? I had been wanting to update my original website for some time, as I became increasingly aware that my company’s needs had grown beyond my original sites functional capabilities. It was during Marie Forleo’s B-School course that I realized it was time to build an updated site that truly represented my brand aesthetically and functionally. I had been searching for the right firm for about a year before B-School finally prompted me to buckle down and make it happen, which is when I made my final search out of state and to my delight, found Doodle Dog! We started working together shortly after with a goal of launching the new site around my company’s 5 year anniversary, which just seemed like the perfect way to celebrate that milestone! What’s your favorite part of your new site or new brand? Gosh, it’s hard to pick a favorite part – I love it all so much! I am definitely pumped to have a Home page and About page that finally feels like an invite to hang out and get to know us, instead of the sometimes over-polished “interior designer” box I felt I had to fit in to when starting out 5 years ago. Nikki and her team did such a great job of listening to me and helping me translate my heart and vision for this project in to a site that is truly an authentic representation of my brand in every way. I’d like to thank my dogs, Rufus and Nellie, for being so adorable unfailing examples of unconditional love in a world of conditions. They inspire me.